In the 7th century Tibet arose as newcomers on the stage of history. 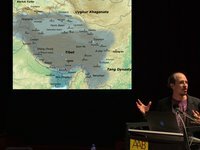 This talk will explore how the royal aesthetics of their nomadic court exemplifies an energy and spirit unique to the explosive and short-lived Tibetan Empire (7th-9th centuries). By looking at how processes of transfer and translation informed craftsmanship, types, shapes, and decorative motifs, this lecture will offer an opulent and vivid narrative telling of the rise in history of the early Kings of Tibet during its tryst with imperial greatness. Beginning with the reign of Srong-btsan sgam-po, in the first half of the 7th century, and reaching it's political military height during the time of Khri-srong lde-btsan, in the late 8th century, the royal nomadic encampment of Tibet engaged itself in the building of an imperial kingdom that was one of the largest the world has ever known. From royal hunts to sumptuous feasts, opulent marriages and massif funerals, Tibetans of this time fashioned themselves as matchless warriors and universal monarchs. Through images of paintings and silk, and objects of gold and silver, this talk promises to be if anything else a feast for the eyes and imagination. David Pritzker is currently working on his DPhil in Tibetan and Himalayan Studies at the University of Oxford. His research revolves around the production of early cave paintings from the 11th to 14th century in the ancient Kingdom of Guge in Western Tibet, where, he has recently returned from a six-week fieldwork expedition. David's expertise in the history and culture of the Himalayas stems from life long experience of the regions art, in situ and around the world. In 2008 David began to work as an assistant curator for Himalayan Art Resources an encyclopedic website dedicated to the arts of the Himalayas. Prior to this, starting in 2006, David worked as a Curator of Himalayan Art at the Rubin Museum in New York City where he was tasked to evaluate the collection in order to select out the best objects whereby forming their initial permanent collection. On the heels of this work he curated their first exhibition on Nepal entitled, "From The Land Of The Gods: The Art of the Kathmandu Valley". David Pritzker also produced a small show in Aspen, Colorado, "Ocean of Wisdom, Embodiment of Compassion: Glimpses of Tibetan Buddhist Art" curated by Pratapatitya Pal in 2008 for a conference on Tibet. David completed his undergraduate degree at Stanford University with a B.A. in History. He holds a Masters from Oxford.